What creatures did Edward Hitchcock think made the Connecticut dinosaur tracks? In the mid–1800s, Edward Hitchcock was a clergyman and president of Amherst College, Massachusetts. In 1836, six years before the term “dinosaur” was coined, Hitchcock presented a paper describing the footprints in stone found in the Connecticut Valley. He collected over 20,000 of these fossil footprints during his life-time, and organized the world’s largest collection at Amherst College. He believed giant birds made the tracks, not lizards or reptiles. 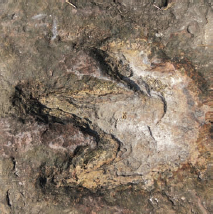 The first dinosaur track, similar to this one, was officially described in the early nineteenth century and was discovered near Holyoke, Massachusetts (iStock).